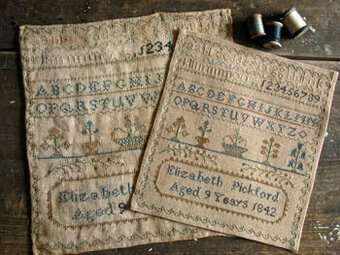 Model stitched on 32 Ct. Natural linen with DMC floss. 61x94. Finishing instructions included. 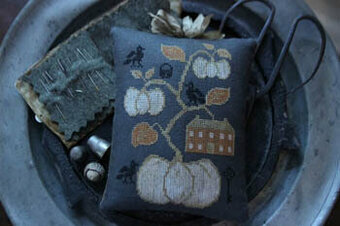 Model stitched on 28 count Autumn Field Vintage Cashel Linen with DMC floss. The stitch count is 79W x 114H. 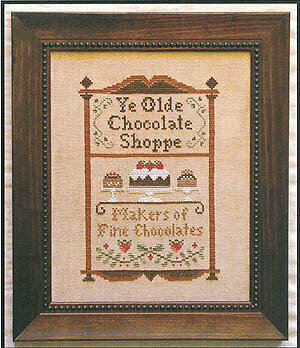 "Ye Olde Chocolate Shoppe - Makers of Finer Chocolates." 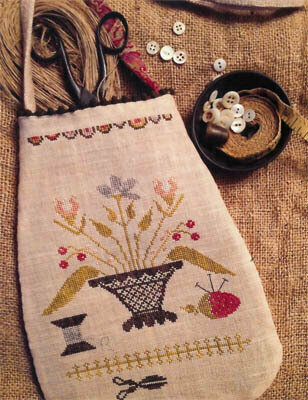 Model stitched on 28 Ct. Days Gone By linen with Gumnut Stars (G328, G943, G947) and Thread Gatherer Silk N Colors. 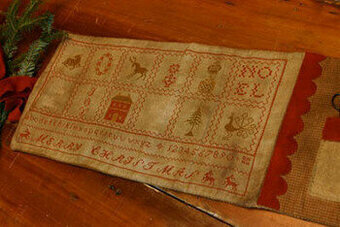 Stitch Count: 42 x 135. 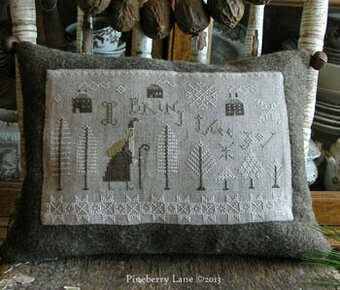 The model was stitched on an 8" x 10" piece of 32 Ct. Old Farmhouse Linen by Notforgotten Farms with DMC floss. 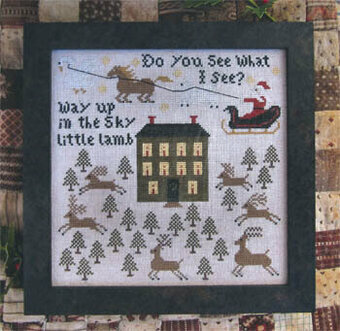 Model can be stitched on 14, 16 or 18 Ct. Aida (color of your choice) using Gentle Art Sampler Threads. Stitch count is 205W x 338W. 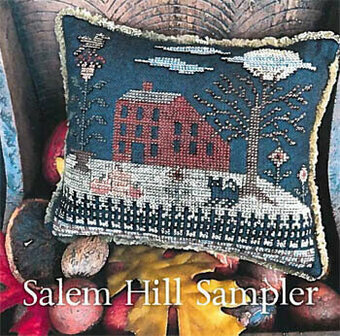 Also required, but not listed above Gentle Art Sampler Thread Amethyst. 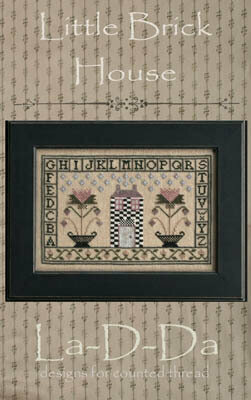 Model stitched on fabric of your choice using Gentle Arts of DMC (321). 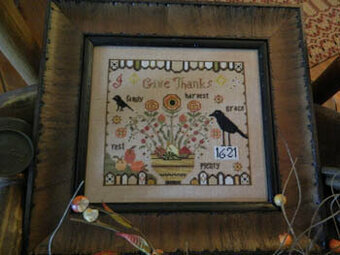 Stitch count 247x399. 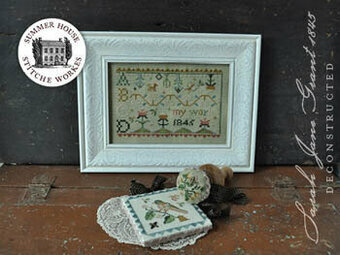 Model stitched on 36 Ct. Cocoa by Weeks Dye Works with Gentle Art Sampler Threads & Weeks Dye Works floss. 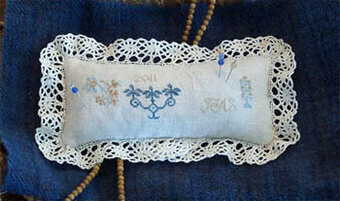 Stitch count for Hornbook is 54x156 & stitch count for the pincushion is 35x40. "When flowers as Emblems we survey A Moral they disclose In Youth they bloom in Age decay Then imitate the rose. 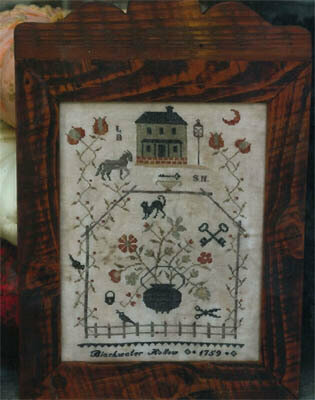 Hannah Gurney 1769" Model stitched on 36 Ct. Vintage Bisque using Needlepoint Inc. Silk (or all DMC 3820, 927, 501, 500, 3779, 223, 3722, 3721, 221, 733, 3768, 3012, 352, 347, 3363, 3046, 780, 3774, 754, 841,3862, 738, 758, 951, 746, 928)Also required but not listed above, Needlepoint Inc. Silk #876. Stitch count is 169W x 190H. Model stitched on 32 Ct. Buttercream by Lakeside Linens with Weeks Dye Works floss. Color chart. Stitch Count: 139x140. 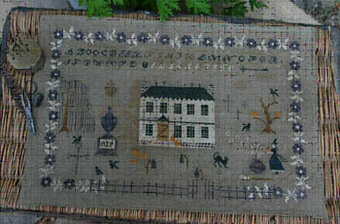 Model stitched on 36 Ct. Vedlt by Picture This Plus with Gentle Art Sampler threads and Weeks Dye Works floss. 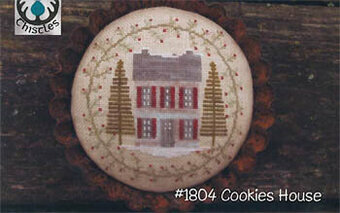 Stitch Count: 184x105. Model stitched over 2 threads on 36 Ct. Summer Khaki Edinburgh linen with DMC floss. Stitch Count: 126W x 71H. Finishing instructions included. 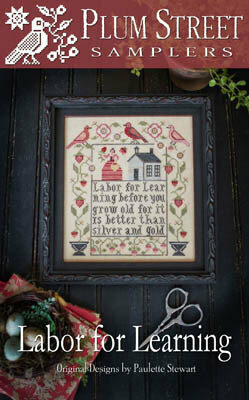 Models stitched over 2 threads on 32 Ct. Parchment linen by Weeks Dye Works with Classic Colorwork floss (or DMC 3777, 902, 351). Model stitched over 2 threads on 40 Ct. Gold Sand by xJudesign (or fabric of your choice). Stitch Count: 242S x 251H. Use your choice of color threads using one color or two. 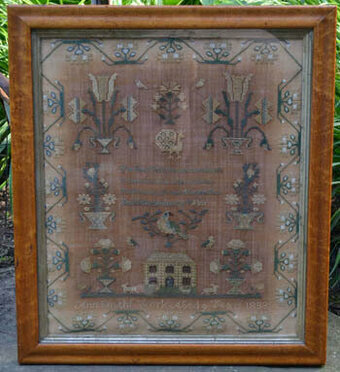 The model was stitched using different shades of Silk N Color purples for each of the motifs. You will need approximately 5 skeins. Also required, is one skein each of DMC 312, 422, 3052, 3740. Model stitched over two on 36 Ct. 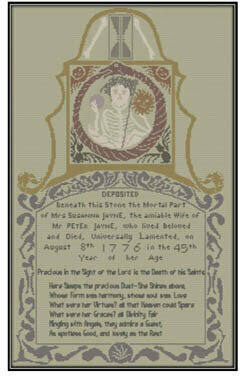 Beige by Weeks Dye Works using DMC floss. Stitch count 168x82. 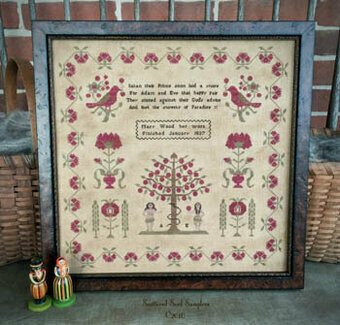 Model stitched on 40 Ct. Goldfinch Linen by R&R Reproductions that is dyed with coffee and tea before stitching. 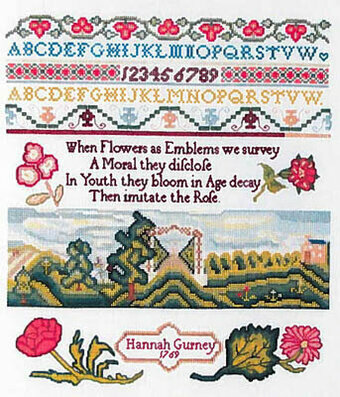 Stitch Count for flower on pocket: 144W x 74H. Bargello on back: 145W x 69H. 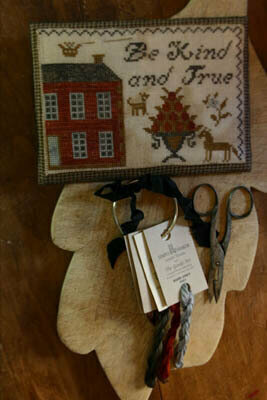 Kit Includes: Stamped 10" by 12" white Kona cotton, needle, floss and instructions. Finished size: 7" by 9"
Model stitched over 2 threads on 32 Ct. Straw linen with NPI Silks (or DMC 3857, 902, 500, 3859, 3750, 304, 3047, 739, 3782, 167, 780, 926, 930, 939, 3782, 310). 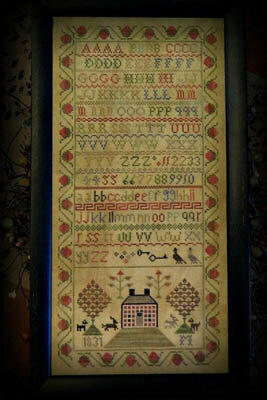 Stitch Count: 111W x 197H. 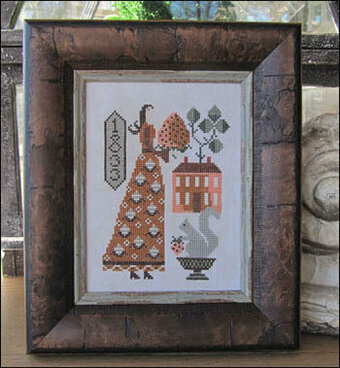 Model stitched on either 35 or 36 Ct. Mocha linen by Weeks Dye Works using Needlepoint Inc. Silks. (DMC alternates are 832 580 824 712 3045 3371 501 613)Stitch count 217x274. 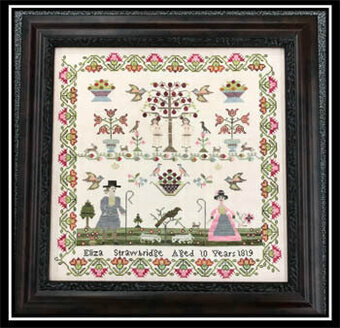 The model was stitched on a special cut of 40 Ct. Chantilly Creme by Lakeside Linens with Needlepoint Inc Silks (or DMC 498, 927, 833). 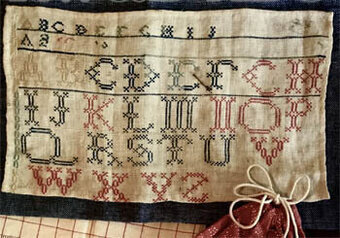 Stitch Count: 227x757. 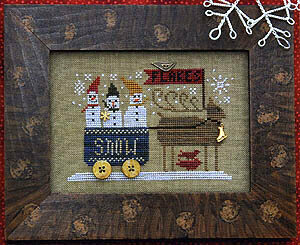 Model stitched over 2 threads on 40 Ct. Fog linen from Picture This Plus with Needlepoint Inc Silks (or DMC 524, 320, 890, 3830, 433, 782, 352, 712, 3031, white, 310). 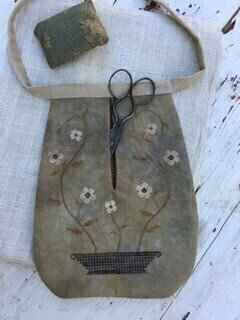 Stitch Count: 66W x 88H.